The Knights of Columbus is the world's l﻿a﻿rgest C﻿atholic fraternal service organization. Founded by the Venerable Father Michael J McGivney in New Haven, Connecticut, in ﻿1882, it was named in honor of the mariner Christopher Columbus. Originally serving as a mutual benefit society to low-income immigrant Catholics, it developed into a fraternal benefit society dedicated to providing charitable services, promoting Catholic education and actively defending Catholicism in various nations. There are more than 1.85 million members in nearly 15,000 councils, with nearly 200 councils on college campuses. Membership is limited to practicing Catholic men aged 18 or older. Membership consists of four different degrees, each exemplifying a different principle of the Order. We hope you enjoy your visit to our web site. 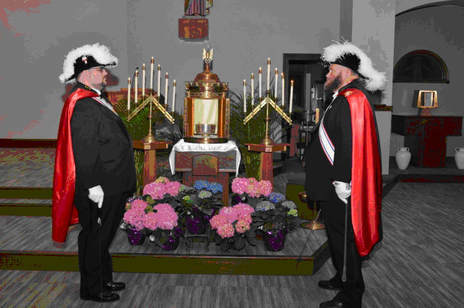 A library of information regarding our council and the Knights of Columbus in general is available by using the above links. Please feel free to contact us with any questions.